Considered a stillwater staple, damsel flies are available in some shape or form year round. The damsel nymphs active habits constantly place them at risk. Whenever I explore new waters a damsel nymph pattern is a favorite choice. The bold nymphs are an accustomed sight to the foraging trout. Damsels belong to the order Odonata, one of the oldest and most primitive with species dating back to prehistoric times. 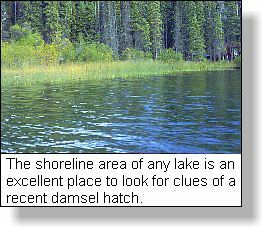 With over twenty known species damsels are widespread across North America. Damsels are available to the stream angler too. Damsels also inhabit slow moving rivers and streams. Lakes and ponds are a favored haunt. Here their aggressive behavior exposes them to foraging fish. 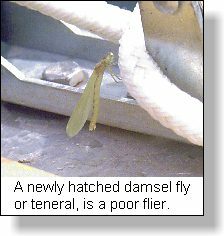 Damsels have an incomplete metamorphosis. Some species spend up to 2 years as a nymph, although cycles of 1 year are more common. The nymphs are aggressive predators. Damsels use their lower jaw to capture prey in a frog-like fashion. Favorite prey includes: scuds, chironomid larvae, mayflies and even each other. Damsel fly nymphs are sight feeders. Their prominent eyes investigate any suspicious movement. Damsel fly nymphs are a long skinny creatures with three paddle like tails. The tails are actually gills and provide balance and stability. Damsel nymphs reach up to 1 1/4 inches at maturity. Damsel nymphs come in a host of colors from dark brown, to light olive and dark green. Vegetation is a great clue to choosing the right color pattern. Weed beds are a favorite location for damsel fly nymphs. Damsel nymphs favor long stemmed weeds waiting in ambush on the undersides of the leaves. Damsel nymphs are steady swimmers. The nymphs plod along with a sculling motion coupled with rests. 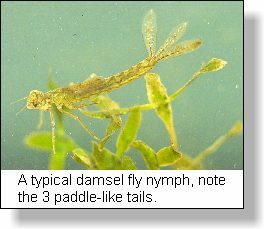 Damsel nymphs hold their legs out stretched when swimming to provide stability. Mature damsel nymphs swim en masse slightly sub surface towards shore to emerge. Migration occurs in the late spring and early summer. The best time to see this migration is the late morning or mid afternoon. Damsel fly nymphs crawl out of the water to emerge. Any structure will do. This includes anchor ropes or crawling up your float tube or kick boat. Take the time to observe the transformation from nymph to adult. It is one of the miracles of nature. The newly emerged adult or teneral becomes prey for other insects, birds and trout. Trout rub against the tulles, knocking the hapless insects into the water. The trout returns to leisurely scoop up the floundering tenerals. The adult has a slender abdomen and holds its wings parallel to the body while at rest. Capable fliers, damsel flies feed upon insects such as mosquitoes and chironomids. Damsel flies are aggressive lovers. The male grasps the female with a pair of claspers behind her head. In this tandem position mating takes place. The female lays her eggs, often still attached to the male. Some species oviposit by dropping their eggs from above or by dipping their abdomen in the water. I have seen some females crawl below the waters' surface and deposit their eggs directly into the vegetation. The adults continue on throughout the summer and fall until the first frosts of the year kill them. Popular lines for imitating the nymph include: floating, intermediate and sinking lines. In non hatch situations' imitate the immature nymphs on or near the bottom. Leader lengths from 9 to 15 feet are fine. My favorite retrieve is a slow hand twist coupled with pauses. Gary Borgers' strip tease retrieve works well too. The strip tease retrieve consists of a slow one foot pull while vibrating your rod tip up and down with your casting hand. The vibrating rod tip causes the fly to jiggle in the same manner as the swimming nymphs. Trolling damsel nymph patterns is another good tactic. As I explore a new lake a slowly trolled damsel nymph pattern has always worked well. When fishing a hatch situation, it is important to retrieve your pattern in the same direction as the migrating nymphs. Anchoring near the tulles or long stem bull rushes is an exciting way to fish. Trout will follow the migrating nymphs into very shallow waters. Aggressive rises are an indicator trout are feasting on the nymphs. To determine if a hatch has taken place make a habit of checking the shoreline vegetation. Look for the tenerals or cast husks of the nymphs on the tulles or long stemmed bull rushes. Occasionally trout feed upon the adults. If conditions are right trout will feed upon the newly hatched tenerals and egg laying females. An adult pattern presented dead drift is a good tactic. Make your fly struggle by adding the odd twitch. Use a stout leader, hooked trout will try to escape by dragging you through the shoreline vegetation. Trout will seldom pass up a well-presented damsel fly pattern. When fishing is tough or sporadic a damsel nymph pattern is a favorite choice. Just about every lake or pond has a population of damsel flies. They are a year round food source for the fish. They are an integral part of my fly box and fishing strategies.